﻿The producer was certainly on the ball when he recorded a concert with CTI stars on a short tour of the USA in 1973. Thus the beginning of the jazz-rock era was documented in jazz’s country of origin. 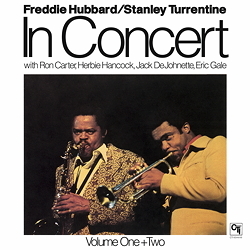 Liberated from the often-sterile atmosphere in a studio, Freddie Hubbard, Stanley Turrentine and friends (here also without a sometimes stifling studio band) could exhibit their amazing improvisational talents as soloists in lengthy works. This was greatly facilitated by the groove conjured up by Herbie Hancock, Ron Carter and Jack deJohnette – who had all profited from Miles Davis’s tutoring. And let’s not forget Larry Gale, a not unknown or bad guitarist, who transported hot Jamaican rhythm to the wintery Chicago and Detroit.